I repurposed my Pentium 4 HT tower a while back (no more Windows!) 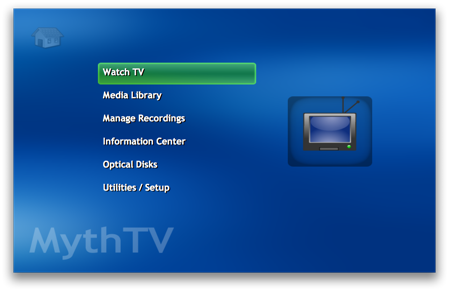 to run knoppmyth, a custom Linux distribution for MythTV that makes it as easy as possible to set up a beige box as a PVR. In our house, this box's primary purpose is to record Spongebob Squarepants ad infinitum, with the occasional Daily Show with John Stewart thrown in for the adults. It works great; I don't even have a monitor hooked up to it anymore, just the TV with the Hauppauge 350's IR sensor hot-glued to the front. 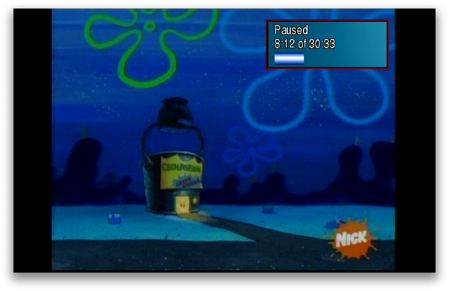 MythTV is often used just like this, with a single machine hooked up to a single television or monitor. However, it can also act as a media server for your network, making all the recorded shows, your music files and pictures available to any other machine on your network running the MythTV frontend. So, I was pleased to fine pre-built binaries of the MythTV frontend for OS X over on their wiki. I downloaded one from The Snider Pad and didn't have too much trouble getting it up and running. All I had to do was change the permissions in the MySQL configuration file on the MythTV box to allow non-localhost connections (set bind-address to 0.0.0.0 in /etc/mysql/my.cnf). After that, I could sit on my bed with the MacBook on its 802.11b connection and watch any of the recorded shows, or live TV even, remotely from my MythTV box.